In this post, Scott shares his discovery of Renee & Jeremy’s sweet sounds, how our paths crossed with theirs, an overview of their work, a link to a free download for all to enjoy, and a chance to win one of their magical cd’s + a Love All the World bodysuit or tee from Tender Sapling. Have Fun! I first learned of Renee & Jeremy five years ago in 2008, shortly after they released their first album, It’s a Big World, the year before. That was a magical time in our family. Our second son was still in his first year and his big brother had just turned four. I enjoy making a mixed CD for Emily’s birthday every year, and that fall I was seeking mellow yet upbeat, sweet and pure. I wanted a mix we could play at home, in the car, most anytime, that would be as attractive to the kids as it was to their parents. I struck gold with Renee & Jeremy. We listened to It’s a Big World, on repeat, a lot. And that mix with four songs from the album? Still one of our family’s favorites. 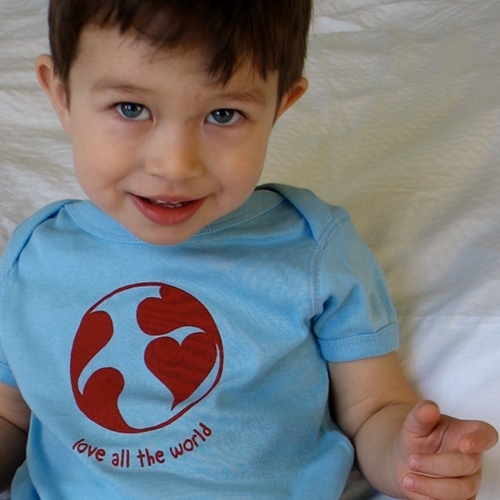 If you purchase or receive as a gift one of our Love All the World bodysuits, tees, or bags you will notice in the Activity Tag that we recommend R&J’s song “It’s a Big World” as a song that helps children celebrate embracing the world. After we went to print with that we reflected that the song “We Are One” from the same album is even more directly about embracing the world and seeing us all as one. But you can’t go wrong – both are beautiful. We wrote Renee & Jeremy to let them know that we’re promoting their song, and they were incredibly warm and gracious. In fact, they were thrilled to cross-promote with us. We offered them shirts for their kids and they shared their latest albums with us. Each of their kids loved the Love in Henna style (they are a great musical duo, not a couple — they have their own spouses and kids). I had seen the video for C’mon when it came out in 2009, but for a number of reasons we weren’t in a music-buying time of life (recent move, baby on the way, etc. ), so I hadn’t heard the rest of the album. Turns out we were really missing out. It’s a great second album, in which R&J expand their soulful ballad and lullaby repertoire but also explore more kinetic beats. A Little Love, a collection of covers released in May, is chock full of sweet love brimming with laid back harmony; some of these (like their version of Queen’s “You’re My Best Friend” – long a favorite) will rival or maybe even replace the originals as my favorite versions of these songs. There are also a few clever surprises; who would have thought of Red Hot Chili Peppers’ “Give It Away” as a delicious child-friendly ditty? R&J have been busy this year. Following up on A Little Love, they’ve also just released Sunny Christmas, a warm infusion of holiday cheer to any lucky listener. Speaking of luck, R&J generously offered us a few CDs that we will make available as giveaways to our lucky readers! 1) We’re giving away one copy of Renee & Jeremy’s It’s a Big World CD, along with one of our Love All the World bodysuits or tees. Comment by 11:59 pm EST, Thursday, November 22 (Thanksgiving Day in the U.S.) to enter. Winner will be randomly selected and announced here and on Facebook and Twitter on Friday, November 23, and must reply within 3 days or prize goes to the second name drawn. One comment per person, please. Bonus entries will be provided for those who follow us on Twitter & tweet this giveaway with @tendersapling. 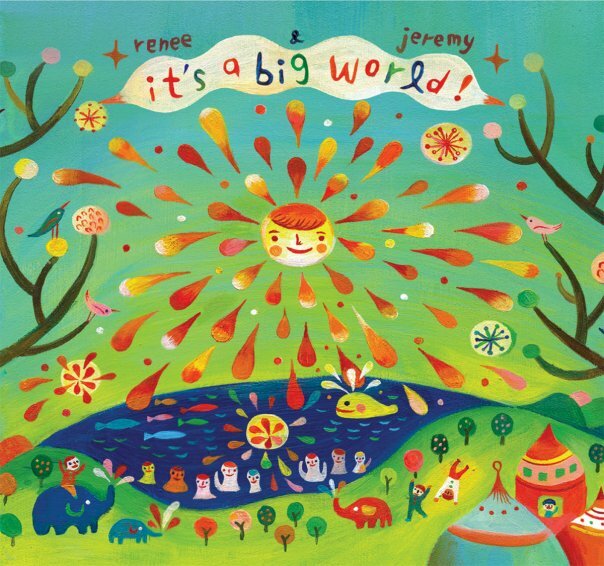 2) Delight your ears with a free download of Renee & Jeremy’s “It’s a Big World” on our Facebook page. If you haven’t already, go ahead and click “Like” Us while you are there. Can’t wait to read your thankfulness thoughts! In the meantime, we hope you enjoy discovering Renee & Jeremy’s tunes as much as we have. We’re grateful for them in our lives and are sure you will be too. NOTE: This Giveaway has ended. The winner of a Renee & Jeremy It’s a Big World CD & a Tender Sapling Love All the World Tee or Bodysuit is Ashley, who has received details via an email from us. Congrats, Ashley! Many thanks to all who entered and shared what they are grateful for. The thoughts in the comments below were very moving to read and we hope everyone enjoyed them as much as we did. Categories: Have Fun, World Citizenship | Tags: children's music, Giveaway, It's a Big World, Love all the World, music, Renee & Jeremy, Thankfulness | Permalink. I, like most of us I suspect, have much to be thankful for. And while I, of course, am thankful for my loving family, my cozy home, my good health, my supportive community…this year I am thankful for re-discovering & re-claiming a part of my self that has been in hibernation for 20 years. I grew up on a small farm where we owned a few horses. My love for them grew deep. They were my escape from a mentally ill mother. They were my unconditional love, my safe place to land. After leaving for college, I was unable to really find a way to fit horses into my adult life. A marriage, a house, grad school and two little boys later and I am finally figuring out a way to get back to the barn and back in the saddle. As many mamas know…it’s such a challenge to carve out time to be just us…the women we are underneath the layers of mother/daughter/partner/friend etc. It has been so therapeutic to rediscover my love of all things horses and reclaim a part of myself that has laid dormant for so many years. That it what I am feeling most grateful for this year. If I were to choose just one thing, it would have to be raising my two incredible daughters in the Holy Land with my amazing husband. There are so many, many things. Last night, as I was lying in bed trying to get to sleep, I suddenly felt this surge of thankfulness about my parents. I was recalling the recent time, just a couple of years ago, when my father was deathly ill and in an out of the hospital for about a year. It was a scary, vulnerable and raw time. My mother spent every single day at the hospital, with her thermos of water, her bag lunch, and some magazines, as she sat by his side, cheering him on. He eventually recovered, and today they are very vibrant seniors who are actively involved in their church, their retirement community and our family life. I am incredibly thankful that I have my parents as examples of how to be a strong, committed and loyal couple. I am thankful that our family grew this year and we now have two wonderful, healthy daughters. I am thankful I got to see my extended family recently and that I am getting to spend fun time with my immediate family now. Extremely grateful that everyone is doing well, including the baby joining us in just a couple of months! I am so thankful that I get to be a mom. Even with all the ups and downs there is truly nothing sweeter and for that I am forever grateful. I am grateful for all the incredible Blessings God keeps sending my way when I have done nothing to deserve them. He really is the all Generous! I love reading the other answers as I have many of these things to be grateful for as well. Right now I am thankful for the gift of life. I have been thinking about this the past few days especially as my high school 10 year reunion is coming up (which I am unable to attend) and I just learned that three of my classmates have already passed away, two from cancer. So I am thankful just to be alive and to have one more moment, day, week, month, year to learn, love, and live. I’m thankful for my husband, we have been through a lot in 15 years but we’re still going strong! I am thankful to spend the holidays (and all of the time) with my cute little guy! I’m so thankful for my amazing husband who works hard at work and at home. I’m thankful for the grace of God. I am so thankful for my family’s good health this year. I am also thankful for the wonderful, safe neighborhood where we now live. i am thankful for the ability to say that I am thankful. The world has so much good and bad and I am just so elated that I can be a part of it. i am thankful to Baha’u’llah that I am a Baha’i and a pioneer in the middle east. May our services be accepted at his Threshhold. Also thanks and all the best for yur interesting site for children. May u be successful in yur endeavors. Baha’i love and greetings from Tabandeh Sabet. My renewed relationship with my mother. I love you, mom. I am thankful to have gained – since my two-year old son came into the world – an inkling of the tremendous devotion, dedication, creative energy, love and sacrifice that human beings pour into raising the young ones in their fold each and everyday. I am continually struck by how obvlivious I was for so many years of all this constructive, positive human exertion going on all around me. Thank you for the beautiful reminder of this that is embodied in your blog! I’m thankful for a job that I love. I’m thankful for the health of my baby who was born premature but is doing great now! I am incredibly thankful for the health of our family. We have daily struggles with different diagnoses, but it’s a gift to be alive! I too am thankful for my little family. What adorable body suit designs! We are thankful for a great 4 day weekend with the family to celebrate and relax. I am thankful for my family. Money tight, but we are able to have a great Thanksgiving. I’m thankful for my family, warm house and good job! kristiedonelson(at)gmail(dot)com Thank you. I am Thankful for my family above all else. Thanks! I am so thankful for my own parents, my loving/supportive husband, and my beautiful healthy children. I am blessed to be surrounded my family this Thanksgiving!!! I am thankful for my two little boys. my 6 year old has turned into such a helpful little boy to the other kids in his class at school and he is always trying to do the right thing. My other little boy is 3 and his teacher has told me he’s the best “cleaner upper” and the sweetest little boy. Both of them are quiet and fairly reserved but when it comes down to making someone happy or helping someone out they are the first to participate. I love their little laughs and the smiles they bring to my face. I am so thankful for their comments too “mommy the trees are going to sleep. naked.” <–in regards to the leaves falling off the trees lol. I am also thankful for their daddy. My husband works so hard more than 60 hours a week to provide for our family and takes full advantage of time with the boys to make sure they are happy and running around playing with him. I am grateful for my husband’s job that allows us to buy our needs for our family. Iam grateful for my husband and my family. I am thankful that my husband still loves me after all. I am thankful for a happy healthy family. I’m thankfulf for God and Jesus, my family, my friends, my freedom, my job, everything I have. I am thankful for my family being here for me. I love them. I am also thankful for God loving and protecting me. I am thankful to be at a place in my life where I am content day to day with my life with my family. This year I am thankful for a having a healthy family and for having concieved a baby girl who is due in April! I am thankful that my children and my husband are healthy. I am thankful for my family’s usually great health. Although we currently all have yucky colds.